When someone says "Lets go to uptown for breakfast/lunch", I automatically assume they want eat at Village Park. Stereotypical reasons but it happens from time to time. Now, there may be a new reason to visit Uptown Damansara, and it's not for the nasi lemak! We started off with some light and refreshing mojitos. This was one of them and by far the best among all that I've tried. Fizzy, refreshing and absolutely addictive! I also believe the priced was rather reasonable for its taste. For those who wishes to have something much lighter and slightly more fragrant, I would recommend the peach tea. Light in body and soothing in flavour. I guess big breakfast is pretty common nowadays, almost every restaurant serves it. The only differences would perhaps be the method of preparation, ingredients and price. Porto Bello's big breakfast wasn't too bad as everything was cooked perfectly. It was also seasoned well and the scramble eggs were absolutely delicious. Overall, a pretty good big breakfast. If you're tired of the ordinary big breakfast, opt for these instead. 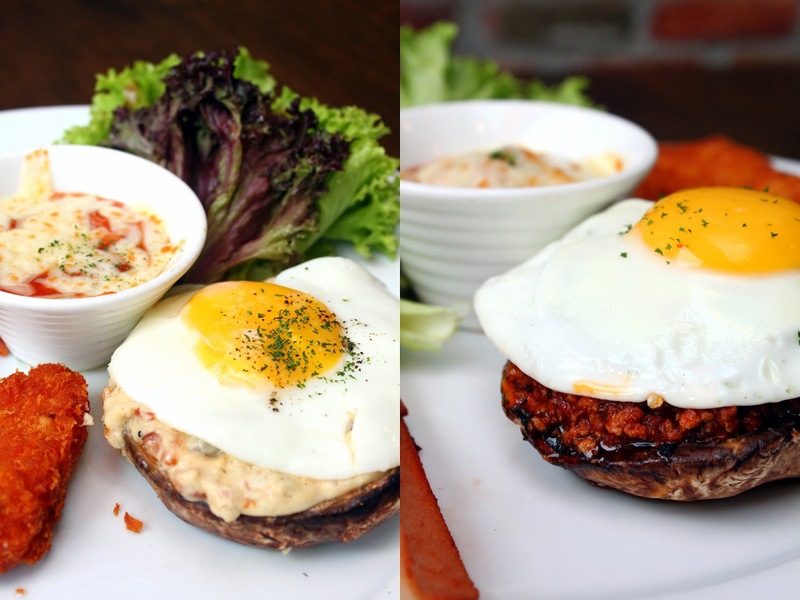 Delicious and beautifully cooked portobello mushroom topped with a filling of your choice. For me, I prefer the volcano surprise a little more due to its tinge of fiery sensation. But overall, the simplicity of these dishes were astounding. This was one of the unique dishes that we had in Porto Bello. Though I appreciate the addition of avocado within the tartare itself, the flavours didn't work that well for me. It felt as if each element within the dish is living in its own world and simultaneously layered upon one another instead of working cohesively. However, it wasn't all that bad, I just didn't like it as much. Simple and beautifully cooked escargot finished with delicious alfredo-like sauce. To be honest, I felt as if the sauce was the star of the dish instead of the escargot because it had quite a flavour. Smooth, rich, creamy and absolutely addictive. Goes well with almost anything that we licked it dry. It might look pretty simple but at least it tasted really good. Furthermore, the soft bread that was served alongside the mushroom soup was really addictive. Not only was it soft and warm but garlicky as well. Goes really well with the mushroom soup and was a nice alternative to garlic baguette. Even though the owner personally said that his wings were nothing special, I insisted on ordering it because of the blue cheese sauce. Fortunately, I was right. The wings were not only juicy and succulent, but crisp and slightly spicy as well. The blue cheese was pretty subtle and it helps in toning the heat from the wings. Loved it! Beautifully pink was well seasoned. The rack of lamb here at Porto Bello was absolutely delicious. However, my only complain would be the portion. Too little for something this good. Served with a light mint sauce, mushrooms and mashed potatoes. Its fun to order and simply wait for everyone else to try and pronounce it. Hiilarious. But anyway, apart from its humorous side, the Porto Bello's beef bourguignon was actually pretty good. Not the best I've had but certainly good indeed. Lots of flavour, full of potatoes and carrots and the beef cubes were tender enough. However, I did wish for the beef cubes to be slightly more fatty. Gives it extra flavour and juiciness. Crispy and smoky chicken skin that was packed full of flavour. Liked the idea of it but personally I felt that the meat was a little tough for my liking. Apart from that, the flavours were good. It might look unappetizing at first but boy was the meat tender. The only thing which made me held back a little was the overuse of sauce. It's both too thick and overly drenched. But aside from that, the flavours were good and the meat was tender. Served with mashed potatoes and fresh vegetables at the bottom. Last but not least, our dessert of the day. Beautifully made chocolate lava cake that did not simply just melt, but was moist on the cake as well. Served with a scoop of vanilla ice cream. In conclusion, most of what Porto Bello has served was pretty good indeed. Not all were amazing but there are some commendable ones. Everything was cooked right with just the right amount of seasoning. Hence, nothing is overly salty or bland, which was a delight in my opinion. Finally, the price was pretty reasonable as well, considering the presentation and flavour of each dish. My verdict would be, recommended!